At CDL Ohio, it's our job to help you find and enroll in the best truck driving schools in Ohio. We use a comprehensive screening process that rates schools on over 15 different factors that are important to your CDL training to make sure they are the best choice for you. What goes into being the best truck driving school in Ohio? The main reason you are going to truck driving school in Ohio is to get a job, right? For a CDL training school to be featured on our website, they must have a successful job placement program for graduates that puts students into a job they can be happy with. The only way to have a successful career as a truck driver is to get the proper training to begin with. To make sure you have a stable CDL training foundation, you need a school that will not only cover the basics needed to pass the CDL exams, but that will go above and beyond to teach you industry secrets you can’t learn from the CDL handbook. Many prospective truck drivers may find it hard to afford truck driving school, but with our featured Ohio truck driving schools, you don’t need to worry. There are many financial aid opportunities available to truck driving students to help cover the cost of CDL training. 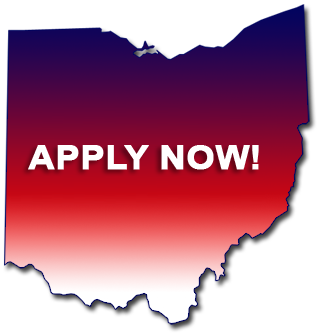 Based in Colombia Station, OH, Great Lakes Truck Driving School’s truck driver training program is conveniently located for many students in or near Akron, Cleveland and Mansfield, Ohio. We chose Great Lakes Truck Driving School as our top-rated truck driving school because they offer many benefits to their truck driving students, such as job placement, financial aid, experienced instructors, a thorough curriculum, and plenty of behind-the-wheel training time. Click here to learn more about the Great Lakes Truck Driving School truck driver training programs and apply today!